Making the conscious decision to eat healthier isn't always easy, and a little extra motivation always helps. Maybe an inspirational mantra or two, some clearly visualized goals, or even an afternoon watching Netflix. As if the streaming service that takes up your weekend wasn't already glorious enough, it's packed with good-for-you documentaries. These nutrition-focused flicks deliver the kick in the pants you need to jump-start, or keep going on, your healthy lifestyle. 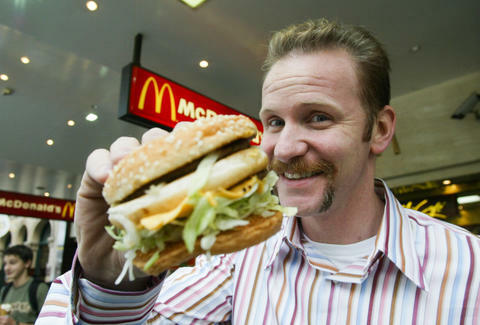 Morgan Spurlock's gluttonous experiment on how fast food is affecting the average American's waistline is as entertaining as it is informative. While he eats nothing except McDonald's for breakfast, lunch, and dinner for 30 days, Spurlock examines how fast-food companies get their customers hooked, and why so many people are addicted. By the end of his experiment, he gains 25lbs, his cholesterol shoots up 65 points, and his body-fat percentage goes from 11% to 18%. His misery throughout the McDonald's-fueled month, and that time he pukes after eating a Double Quarter Pounder and super-sized fries, will zap your cravings for anything fast food. Not for the faint of heart (or stomach), Food, Inc. exposes the ugly truths of how the food we eat every day makes it from the farms to our table. Spoiler alert: there are a lot of cruel and corrupt things that happen in the middle. Making food cheaper and easier to distribute comes at a cost, especially the ethical treatment of livestock and food-factory workers. If you've been contemplating going vegan, this documentary may just be the push you didn't know you needed. Is junk food the new tobacco? It's a concept the creators of Fed Up propose, claiming America's addiction to sugar and refined carbohydrates is the underlying cause of our obesity epidemic, especially in children. It likens the food industry to the tobacco industry, in that soft-drink corporations and other junk-food companies downplay the risk their products cause to human health. This film takes a deep dive into how Big Food is in the pocket of the government (allegedly), and how cheap, highly processed food directly correlates with the rise of Americans getting fatter, sicker, and dying younger. Joe Cross is fat. He's overweight by about 100lbs, and he's bogged down by chronic illnesses and prescription pills. He embarks on a quest for a healthier life by vowing to eat -- rather, drink -- nothing except fresh fruit and vegetable juice, and water, for 60 days. As he drives cross-country through America with nothing but a juicer and generator, picking up fresh produce on the way to make his own homemade juices, he meets average Americans who reveal their own struggles with eating healthy and losing weight. Cross' staggering weight loss at the end of his 60 days will leave you reaching for a glass of green juice. The diet industry in the US is lucrative, and the food industry wants you to rely on packaged, processed foods that make you lose and gain the same pounds over and over. Unfortunately, it's also those kinds of foods that make people sick, tired, and sick of being tired. At times a little hippie-dippie, this doc takes a closer look at how eating a whole-foods, plant-based diet and self-love are the keys to losing weight, maintaining weight loss, and living an overall healthy lifestyle. This documentary follows several people, including narrator and director Lee Fulkerson, as they make a shift from a typical Western diet -- lots of meat, dairy, refined carbohydrates, and sugar -- to a whole-foods, plant-based diet in an effort to combat many of the chronic illnesses that plague Americans: diabetes, heart disease, and high blood pressure. It also looks at the history of meat consumption throughout the world, and why countries that eat more animal products tend to have more chronic illness. Although this film isn't subtle about advocating for a vegan lifestyle, there are some helpful takeaways for the meat-eating folk; namely, that more vegetables and fewer processed foods will do a body good. Christina Stiehl is a Health and fitness staff writer for Thrillist. She has seen Fed Up more than a dozen times and will never get sick of it. Follow her on Twitter @ChristinaStiehl.